Click here for today's devotional. This devotional was written a year ago today! "You hear, O Lord, the desire of the afflicted; you encourage them and listen to their cry,"
I came across this unforgettable photograph from Yahoo News! The woman in the photograph was walking and shouting the name of a loved one who has been missing since March 11th. 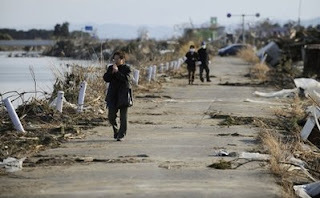 The road she walked on was surrounded by debris and hopelessness by the tsunami torn area. Reading the words that described the photograph on the news page, gripped my heart and moved me to gut flowing tears. This woman's shouts had to believe that her loved one was still alive. The human spirit, especially amongst the beautiful asian people is unbelievably valiant. This asian woman dared to believe that she would hear her loved one answer back in the midst of the rubble to confirm her hopes and silence her fears. Sadly, the photograph said it all...there would be no survivors found. Saddened by this heart wrenching photograph, it became painfully real that this was one 'still' frame of real life out of many. I looked at the photograph and began to scroll to the next frame when I refrained from clicking 'next'. I was reminded that this was not about being sympathetic and moving on; this was truly about being moved to do something...being moved to pray for God to reveal His glorious face and mighty hands. I am convicted to pray by faith in God that His peace ministers to the beautiful people of Japan as He hears their cries. I can no longer allow a photograph to move me for a moment and then casually 'click' to the next frame. There are many in the world around us who are walking along the ruins of life. They are crying out with untamed hope . Their ears desperate to hear the faint shouts coming forth from the mangled rubble of sins destruction. Do I hear the voices? however, will I shout for them in prayer? Will I assist among the ruins? March 17, 2011, "Praise, Encourage and Edify our Glorious God and King"
"And my tongue shall speak of Your righteousness and of Your praise all the day long." Circumstances began to build itself up. My eyes allowed my soul to be overtaken with fear as they seemed to become larger and larger. Before I knew it, my mind was exalting the circumstances like a massive, giant tidal wave only growing stronger as it came closer to land. Then, SUDDENLY! Yes! Suddenly! I could hear through the wind of howling circumstances the still small voice whispering with authority, "Praise your God! Encourage and edify Me, NOW! I long to hear the praises of My people!" O! As soon as I heard this, my heart led my body into this indignant triumphal cheer! "God You are the Mountain Remover! You are Strength over all strength! You are Comforter and Joy to those who weep in mourning! God! You are The Great I Am...there is NO ONE LIKE YOU! NO ONE! NO ONE! When the world glorifies the famous ones, I can shout, "I know THE MOST FAMOUS ONE! I KNOW HIM! HE LONGS AFTER ME! HE DESIRES ME and I desire HIM!" With joyous laughter, I declare, "I know THE MOST FAMOUS ONE!" God! You are The Creator...I am Your workmanship that needs not to be ashamed...if I don't praise You as Jesus proclaimed, then the stones will cry out! I don't want those stones replacing my voice! My flesh will no longer silence me! I will not be silenced! You are God! You are my Triumphant God, Who is, Who Was and Who Is To Come! God! I come to you and encourage You and edify You; I want to bring refreshment to You...for I know as it says in Your Word, when we refresh others, we, ourselves, will be refreshed! I get to bring praises of refreshment to The Great Refresher with the praises of Who You are! I am to be careful not to be a 'Promise digger' to seek out what I can get from You...but I am going to be a 'God digger' and 'God seeker', craving and seeking after Who You are and Your glorious righteousness!!!!!! I must be a cheerleader for My God! I heard as I was praising, "All My people whom I have created are instruments of praise! Let your praises to Me be the 'fingers' that strum your life; exalting, edifying and encouraging Me! No longer allow the 'fingers' of circumstances, worries and concern strum you, for that does not praise Me! I Am your God and I Am MORE than Worthy to be praised! My daughter, be My instrument of praise and no one else's!" Praise is not only a weapon against our enemy...but it's a weapon against our mindsets and distorted perceptions. The weapon of Praise to God refreshes the very core of who we are destined to be; designed by our Almighty God! Let us be trumpets of praise; revealing our Majestic King who enters in...let us honor Him! When we are tempted to complain; let us turn and praise our Glorious God and King! For remember when we complain, we will remain; however, when we praise, we shall be raised!!!!! "Mom, I have a perma-grin, I'm so happy to be here (REACH Church). Mom, I can't explain in words how much I love it...my stomach tickles whenever I think about it." We giggled and giggled some more. Her enthusiastic, tickling response led me to the following interview with her and I believe you will enjoy it as much as I did!!! What caused you to want to return to REACH Church after the first visit? Well, I love the people there and they are like really nice and kind and fun and full of the Lord. Another thing is I get to see my friends there, and I get to learn about the Lord in a FUN way, instead of just words. They don't treat us like little kids who don't know anything. We sing and jump up and down for the Lord. They do skits, they give you silly bands and the silly bands represent something that they are teaching. For example, I got a heart silly band which represents the Heart of God. That is really awesome. So when you come to church what is it that you look forward to the most? O, that's easy...Ok...when I look at my silly bands I get excited and am reminded of getting to see Mr. Weiss, Mrs. Jody, and Mr. Isaiah and the reason why is because they do fun lessons about Faith, The Bible, and The Heart of Jesus. So, for instance, when you look at the heart silly band on your wrist, what are you reminded of? Well, first when I look at the silly band....I don't just look at it as a heart silly band and say, "O, that's cool"...I look at it and I think of God's heart and how His heart is pure and loving towards us. The second reason why I like the silly band, is because I think of the day I gave my other heart silly band to my friend and got to share the message of Jesus with her on the bench at recess. It was really cool. What was awesome, was that no one was on the bench. That leads me to ask you, are there usually people on the bench at recess? O Yes, lots. It was such a "God" thing because nobody was on the bench, it was just me and her...she wants to come to church with me. 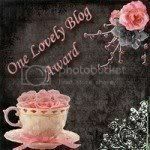 One last question, throughout the week, I have noticed you reading the Bible and you get really excited, so tell me why? Well, the reason why I get excited is I get to read the Bible. It's cool, they give us these bookmarks and the bookmark gives you scripture to read everyday. We read it out loud to our mom and dad and what I think is really cool, is I get to read something new every day out of the Bible but even though it is different it all comes together. You really are a blessing and I can see through your excitement that the Lord has really blessed you at REACH Church. Thank you for your time, have a blessed evening. Thank you, you too mom. Ummmm, mom, I live with you. (giggle). Good night mommy (The room filled with giggles).